Add Jazz Music to Your Newport Visit! Stay after conference and catch the world famous Newport Jazz Festival. The event encompasses 3 full days of music 8/2-8/4 at Fort Adams State Park. Please note that admission to the festival is separate and is not included in conference registration. No student or one-day registration available. On campus lodging available. Click here for information. Boxed lunches available for $15/day on 7/31 and 8/1. Jazz dance is a fusion at its core, expressed in multiple ways. What styles and aesthetics fuse together in your signature jazz style and how do you trace your jazz lineage? Do you see the African roots in today’s jazz dance practices, and how do you teach jazz in a way that honors its origins? How do globalization, technology, and social media inspire new hybrids and fusions that are rooted in jazz dance? How do you connect to authentic jazz dance in your teaching or choreography? Does your jazz practice unite diverse populations or serve your community in a unique way? In what ways do you connect to music? How does jazz connect to race, racism, gender, age? How do you build relationships across sectors, ages, cultures? How do jazz styles relate to the way they are performed (e.g. competitively, socially, recreationally, etc.)? Do you engage in or utilize research in your practice? How do you build community in your jazz classes? Do you have an innovative way of using jazz to engage, inspire, or effect change in your community? 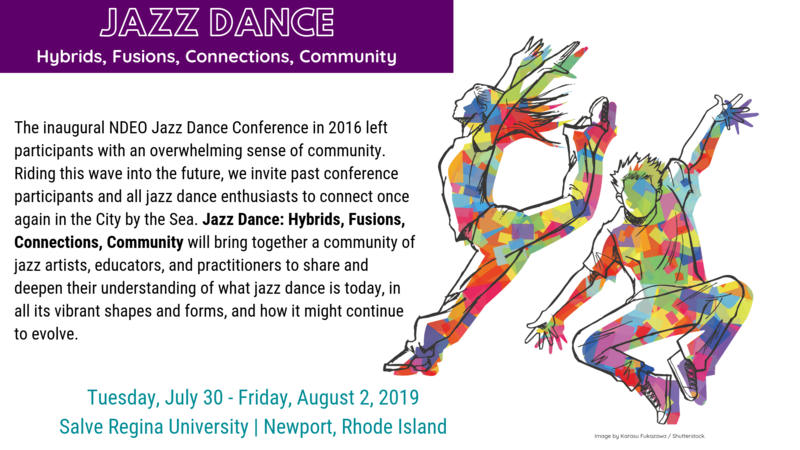 In what ways do you interact with colleagues to advance jazz dance in your teaching environment and your community? What is the position of jazz dance in your place of employment, and how do you advocate for jazz dance? Jam Sessions (20 minutes) - Explore ideas. Jams might explore a warm-up exercise, a brief across the floor combination, or a community building activity. Choreography as Community (90 minutes) - Explore movement ideas/phrases with conference participants; to be performed informally at the conference's conclusion.